I’m not much of a party-goer. I know you find that hard to believe after reading one exciting post after another and seeing how I live life on the edge (of insanity, anyway). 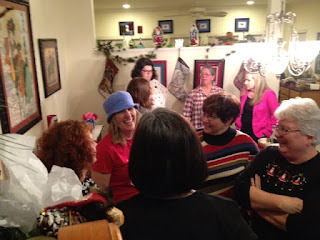 But this past Tuesday night I learned that knitters throw the BEST parties. 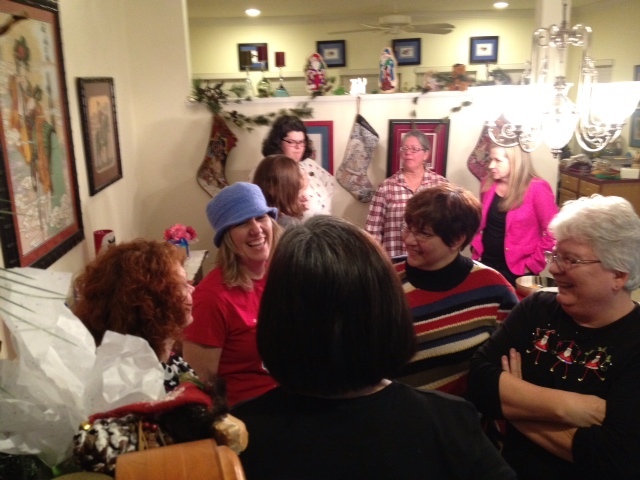 Lady L. courageously invited us all over to her place for a Christmas party. It was great. I think there were at least 30 ladies there. It was an estrogen-fest of epic proportions, one which Lady L.’s husband, David, weathered very well (I told you before he should be nominated for sainthood). 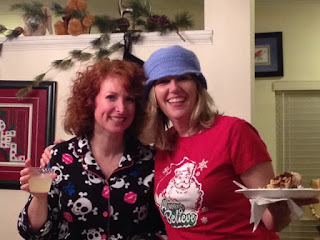 There were all of the standard trimmings to a Christmas party – food, music, gifts. But this party had something fabulous not found at any other party I’ve been to. What, you ask? We brought our knitting. 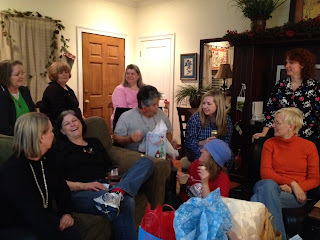 The gifts revolved around knitting. 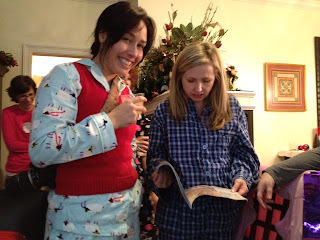 I’d never participated in a “Dirty Santa” gift exchange before, where you can steal someone else’s gift, and I must say, it was tremendous fun. 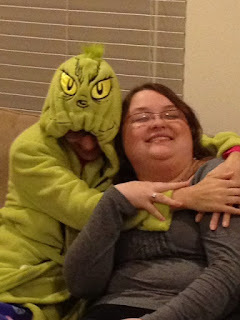 At one point, it did become difficult to figure out who was stealing whose gift and who still needed a gift and who might sneak out the door with their gift before it got stolen, buuuut, SO much fun! Plus, I got to make some new friends and eat some yummy food. And knit. All ingredients for happiness in my book. Yes, those are jammies you're seeing. See that stuffs on the walls? All needlepoint! Anyway, it was a great party and I was thrilled to be a part of it. 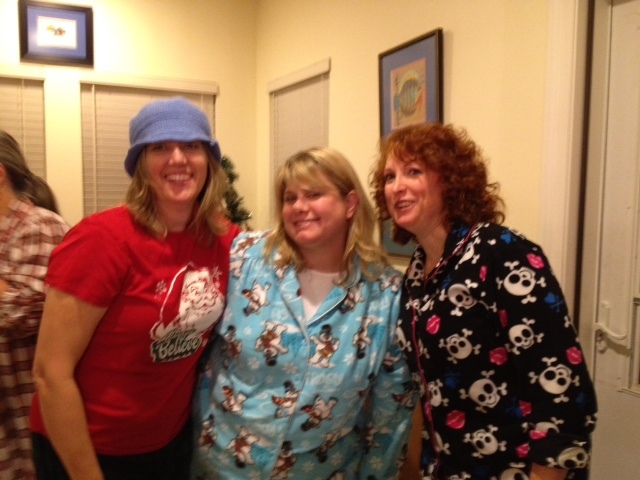 Special thanks to Lorelei (center) for the pics! 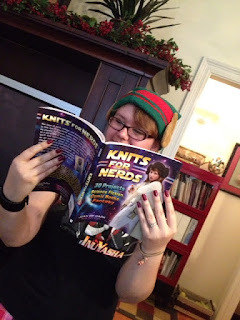 In knitting news, I have been working on the second edition of my daughter’s Christmas gift which is over 50% complete. I think I’ll make it by Christmas. I also managed to block one sweater. I just need to sew buttons on two of them and then another day and a half and I’ll have finished sweater #6 since I started in September. I still have one to do, but received a reprieve of sorts because the get-together where I’ll need it has been scheduled for January (and the angels sang). I am getting excited that it’s getting so close because I will finally get to post pictures. Yay! Anyone else have a “knitty” get-together for Christmas?